Mint tends to be one of the most productive plants in the herb garden. Thankfully, it's not hard at all to use up. It's a delicious tea served both hot and cold. Try your hand at making these mint tea blends to serve your taste buds and your health in an easy and frugal way. Fresh mint can always be used for tea. Simply use 1 Tablespoon of fresh instead of 1 teaspoon of dried in the recipes below. However, mint dries super easily and can be stored for the winter season when fresh isn't as readily available. The dried is just as flavorful, too. Chocolate Mint: Is there really any better combination than mint & chocolate? Put 1 teaspoon crumbled mint leaves with 1 teaspoon Cacao Nibs in a tea ball. Steep for 10 minutes. Black Mint: Get your herbal tea with a little caffeine kick. Combine 1/2 teaspoon loose black tea with 1/2 teaspoon dried mint leaves in a tea ball. Steep for 5 minutes. Green Mint: Combine green earl tea with mint, elderflower, and yarrow in this Waning Moon Blend. 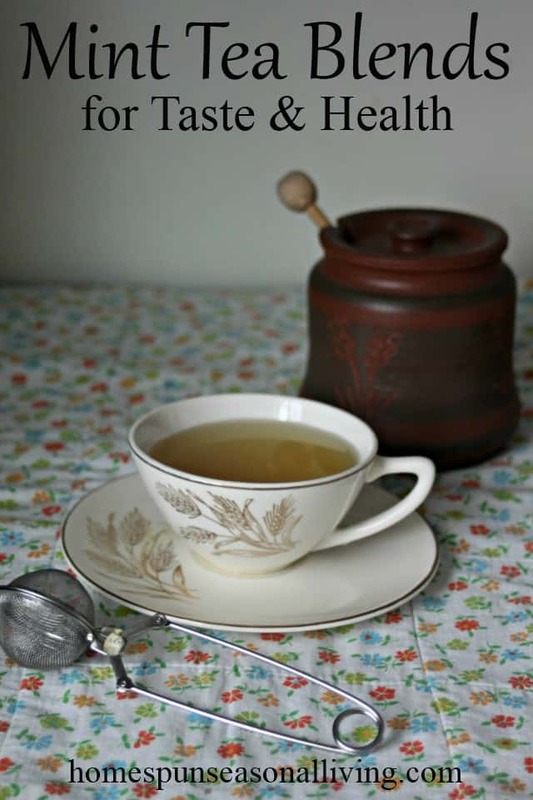 Apple Mint: Steep 1 teaspoon of dried mint leaves in 8 ounces of hot cider. A splash of cream in this makes for a delightful and decadent dessert drink. For the adults add a splash of apple brandy to the cup. Floral Mint: Mint naturally combines well with a number of other floral flavors. This floral blend includes hibiscus, rose, lavender, and chamomile for a delightful cup. Indigestion: Mint, plain old mint tea, is great for soothing an upset stomach. Sipping it hot always works. I'll often make it and drink it cold, Italian Soda style, with a little sparkling water to help soothe an especially upset stomach. This mint tea ‘soda' is my go-too drink after a long run (say 10 miles or so) when a nauseous stomach can't seem to settle any other way. Anxiety: Mint can calm the nerves, combine it with lemon balm to increase the flavor and soothing abilities of both herbs. 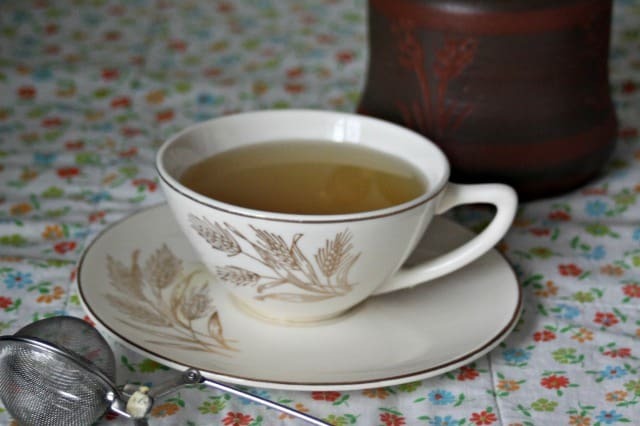 Insomnia: Combine 1 teaspoon crumbled mint leaves with 1 teaspoon dried chamomile flowers and steep for 10 minutes. This blend is used by many folks to help bring about restful sleep in a tasty way. Mint tea doesn't often need much sweetening, it doesn't tend to be bitter. Still, every now and then we all need a little something sweet to drink. A drop of honey or a bit of sugar is easy and often doable in a pinch. However, one can increase the mint flavor by infusing fresh mint in honey. It's a simple but oh-so-wonderful touch to that cup of mint tea. Plain mint tea is always delicious and healthy. However, if you're looking for a change or need a slightly different remedy consider one of the above mint tea blends. Keep that tea ball and jar of dried mint leaves handy until the fresh is available again in the garden. Do you have a favorite mint tea blend? I love mint! I let it go crazy and never try to tame it. My Grandmother had it as ground cover leading up to and all around the chicken coop. It was a good way to cleanse your nostrils after gathering the eggs. Just brushing up against the leaves brought a cloud of fragrance.